Combining our own technical innovations with the latest, most advanced equipment and manufacturing technologies, we are continuously looking for innovations to apply to our new custom road bike frames. Your new custom frame is taylor-made with the maximum precision, no matter which material you decide to use thanks to our artisan workshop equipped with the best system available on the market. Every single piece needs dozens work hours to realize the frame of your dream, compact or traditional, performing in race or comfortable: our aim is to build the custom road bike frames perfectly suited for your physical and athletic requirements to give you the performance that you ever dream. Every aspect of our product range is designed in house by LEGEND, with the upmost care and attention to respect the highest standards. Each new product is subjected to the most extensive accelerated-life testing and crash testing. Available on the whole range of frames realized with metallic alloy, the new bottom bracket with an innovative design, conceived and realized by Legend by Bertoletti, is able to satisfy any need. The increase of the internal space for the cable routing guarantees a higher quality and a more flowing shifting. The particular "tun" shape increases the rigidity of the frame in the central part and consequently, your performance. Standard BSA, in order to be compatible with any existing product in the market and to have maximum reliability. Available on all the titanium, steel, stainless steel and aluminium frames. In order to make your Legend by Bertoletti custom road bike frames even more unique and exclusive, we guarantee the CTT, a process through which we build every single tube of your future bike following your specific needs and requirements, thus making the production of customized tubes a fundamental part of the customization process. The fiber choice and the different layers of carbon leathers offer and guarantee the maximum customization. Available on all models of the carbon range and on VENTICINQUESIMO. For all other models of the range, a wide choice of tubes is available with different thickness, shape and section, all realized following Legend by Bertoletti specifications, and meant to guarantee the maximum quality and customization. A new internal cable routing system, designed by Legend by Bertoletti, to ease the internal cable routing. Thanks to interchangeable inserts, it is possible, on request, to have a frame which is set up for electric and mechanical groupset without needing any modification. The simple and sober lines perfectly match the style of Legend by Bertoletti frames. Available on the whole titanium, steel, stainless steel, aluminium and carbon range. In order to give to your Legend by Bertoletti bike a bit of class, we offer the opportunity to choose your desired pattern and colour. 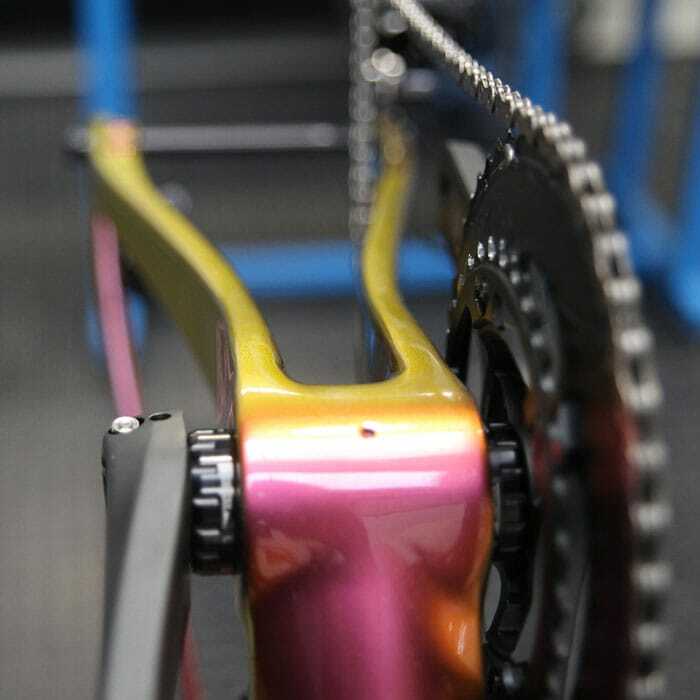 In this way the frame and the components of your bike can be customized, thus reflecting your personality and taste. As a result, your bike will be original and unique. Aesthetic is fundamental for a customized product, and thanks to our wide colour range we can satisfy even the most demanding and whimsical customers. The evolution of road bicycles depended on the introduction of disc brakes. They improved the braking quality in all circumstances and route. Customized head tube obtained from a monolithic, carved with a numerically controlled machine. The perfection and the accuracy of the production make the frame unique and uncomparable. Head tube for tapered forks with integrated bearings from 1''1/8 above and 1''1/2 below. Available on the whole titanium range. Head tube with internal diameter from 43,95mm for headset with external rings for bearings, both tapered and traditional. Head tube for forks with integrated bearings from 1''1/8 above and below. Available on the whole titanium and steel range. All the frames and the components of the bikes Legend by Bertoletti are customized after a meticolous analysis of your physical carachteristics. In the preparation of our products we keep into consideration not only biomechanical parameters, but also your personality, with the aim of offering a product which perfectly satisfies your physical and athletic requirements and allows you to have the performance you have always dreamt of.